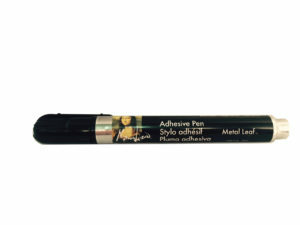 Speedball® is proud to offer a diverse range of leaf, adhesives and tools to suit any artist’s vision and budget. 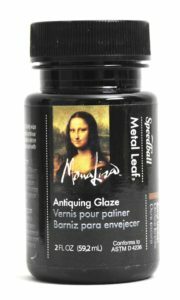 Ideal for use for a range of metal leaf, home décor, and arts & crafts projects, Mona Lisa Brush-On Adhesive is water-based and cleans up easily with soap and water. Available in 2oz. and 32oz. sizes. 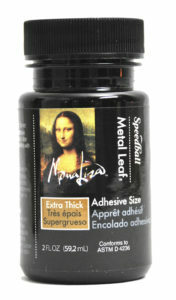 Excellent for metal leafing onto porous surfaces or stenciling projects, Mona Lisa Extra Thick Adhesive is a water-based formulation that cleans up easily with soap and water. Available in 2oz. and 32oz. sizes. 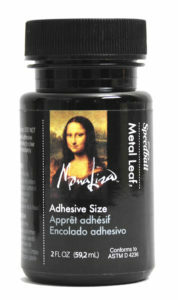 The Mona Lisa Adhesive Pen is great for use to create embellishments and fine detail on a range of metal leafing projects. Available in 2oz. or 32oz. 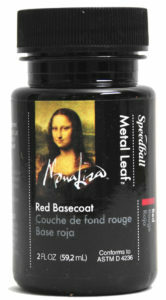 sizes, Mona Lisa Red Basecoat adds a deep red luster to metal leaf projects while sealing the project prior to leafing. This water-based basecoat cleans up easily with soap and water. This water-based glaze is specifically formulated for metal leafing and creates a deep umber hue that gives projects an aged look. Available in 2oz. and 32oz. sizes, Mona Lisa Antiquing Glaze cleans up easily with soap and water. 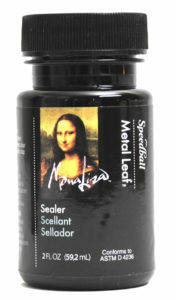 Specially formulated to keep metal leafing projects from tarnishing, Mona Lisa Water-Based Sealer is available in 2oz. and 32oz. sizes and cleans up easily with soap and water.